There's a 12-story miracle in Flushing Meadow Park called Unisphere. It's the largest replica of the world ever built. And the symbol of the 1964-1965 New York World's Fair. Before Unisphere was completed, it confronted U.S. Steel with unbelievable engineering and construction problems. 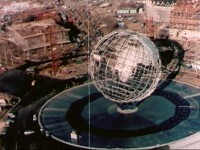 Since it's an open sculpture, with virtually every part exposed, Unisphere had to be built to withstand the rain and ice. And the salt-laden gales that sweep across Long Island. But all these problems were solved. Without sacrificing beauty for strength, or strength for beauty. 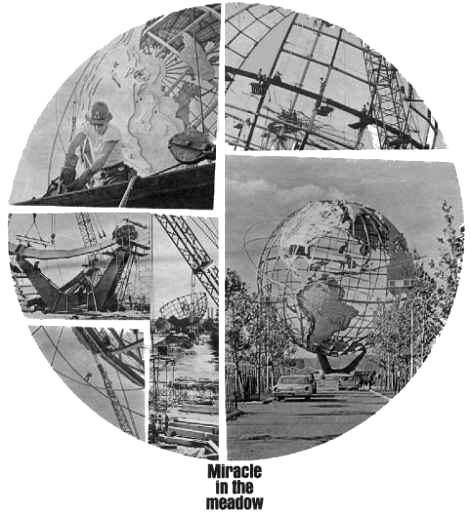 And defying predictions that Unisphere was "impossible," it was completed a full five months ahead of schedule. And when the last section of the stainless-steel globe was put into place, all the pieces fit perfectly. They had to. There wasn't a replacement part on earth, because nothing like Unisphere had ever been attempted before. Unisphere towers 140 feet over a reflecting pool. Has 500 separate parts. Weighs 900 thousand pounds. And has a diameter of 120 feet. It will remain as a permanent reminder of man's aspirations for peace through understanding, and a symbol of his achievements in an expanding universe. Unisphere is truly the miracle in the meadow. Ancient wars, modern conflicts and American foreign policy all surfaced during the course of the New York World's Fair 1964-1965 and left their marks upon the make-up of the International Area. But there were still pavilions that did their part to bring Peace Through Understanding to the Fair. Perhaps the most impressive attendees in the International Area were a large number of new nations, recently liberated from colonialism in Africa, South Asia and the Middle East. 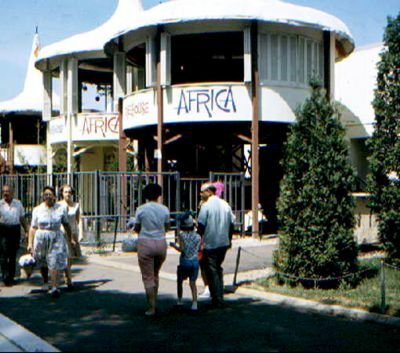 The 1964 Fair was the first time many of these nations had a chance to exhibit themselves as a participant of the world of nations and not as a sideshow exhibit, as they had often been portrayed in fairs since the Victorian era. Without a major showing of Western European nations at this Fair because of the BIE regulations, developing nations captured the attention of the visitors to the International Area. For these nations, Peace Through Understanding was an ideal of the utmost importance - their very future depended upon it. Nearly thirty African nations had exhibits at the Fair, twenty-three of which combined forces to create the African Village.... Amongst the Asian nations with colonial pasts were the Philippines, Malaysia and India. The future prime minister of India, Indira Gandhi, led a special committee for the India Pavilion. She gave a speech on the opening day of the Fair outlining her country's interests in the theme of the Fair. The Philippines Pavilion was shaped like a salakot, a peaked sun hat. Filipino dancers performed traditional dances in an open-air theater, a far cry from an earlier presence of the Philippines at an American World's Fair in 1904. The St. Louis Louisiana Purchase Exposition of 1904 celebrated American expansionist dreams. The Philippines was a newly acquired American colonial property, and was represented in the amusement area with a giant Philippine reservation consisting of villages of four tribes of Filipinos going about their daily lives. Fair visitors could watch the Filipinos in their so-called natural environment and feel proud about the achievements of American imperialism. In addition, American schooling was provided to the tribesmen at the reservation.148 At the 1964 Fair, however, the Philippines was no longer an amusement; it was a participant nation in the "Olympics of Progress." In some exhibits, the Fair succeeded in putting forward the idea that war and strife were unwelcome features of the world when such a fantastic world of peace and brotherhood was possible. Such exhibits, however, were rarely those in the International Area. They were mostly exhibits of American corporations, suggesting that consumerism, more than cultural exchange, was the path to peace. What led to the failure of the International Area to bring about Peace Through Understanding? The Fair began with apolitical intentions, which, it was thought, would advance the theme. It was a non-governmental venture, and it remained that way as far as funding and leadership were concerned. But it was not immune to the influence of the American government, especially the International Area. At times it was instructed to act on behalf of the government. At times it was affected by the diplomatic actions of the government. Other times the Fair actually assumed the role of the government in its own dealings with foreign nations. Over the course of planning and negotiations, the Fair actually shared the intentions of American foreign policy. The IAE conducted its business with the agenda of the American way - the belief in democracy, free-enterprise and freedom. It was, inevitably, a political fair. Moses and his staff, tried as they might, had little power over the International Area. They could not control the events that took place, the exhibits that were built, the fights that ensued and the knowledge of the world that visitors took away with them when they left. Fair planners naively thought that a slogan could overcome the politics, the power and the economic problems of the world, but at the New York World's Fair of 1964-1965, there were limits on Peace Through Understanding. © Copyright 2005 Sharyn Elise Jackson, All Rights Reserved.